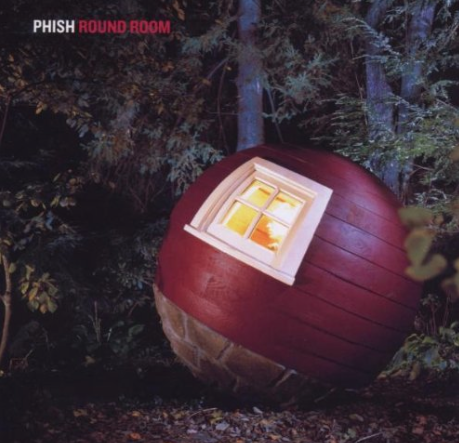 The first two minutes of Round Room lift the curtain on what sounds like a brand-new Phish. The pulse of the opening track, an eleven-minute epic called “Pebbles and Marbles,” is tapped out on cymbals, a code of skittering and splashing that sounds almost like a swing tune. It’s supremely loose music, all green lights on the straightaway, and as keyboardist Page McConnell dances through a Vince Guaraldi-style solo, you can’t help but think: That two-year hiatus did these guys good. We’re traveling a different road. Can’t wait to see where it goes. Then Trey Anastasio begins to sing. And suddenly, with whiplash force, the new vistas vanish and we’re yanked back into the phantasmagoric world of Phishspeak, circa 1995 — that shadowy realm where everything has triple meanings and the words are too cumbersome for the elegant music that carries them. It’s all here: Tom Robbins-ish non sequiturs, ostentatious pronouncements, Zen riddles. “Pebbles and marbles like words from a friend,” sings Anastasio in a coarse voice that often strays from the pitch. “Make us hold tight but are lost in the end.” Oh, the heaviosity! Anastasio, ever the soldier, rides the conceit of “Pebbles and Marbles,” all the while sounding like he’s determined to break through to something better. He grinds out ferocious double-time rhythm-guitar chords as he leans into the song’s hook, and by the halfway point he’s wound the thing up to a full gallop and it’s interesting again. Though the vocals reappear from time to time, the song’s second half is mostly instrumental, and it’s a journey markedly different from the frictionless guitar-star hyperglide that made some Phish shows seem perfunctory. This time, nobody sits at center stage — Anastasio tosses out some melodies, but he’s also cultivating dark, droning chords that ooze menacingly in the background. McConnell — once Mr. Unobtrusive — jabs and thrashes and pounds out frightening chords that have a freakish bipolar character — Keith Emerson coming through one hand, Thelonious Monk the other. He found it on Round Room, which, according to Phish lore, was born immediately after the band members ended their two-year break in October. They reconvened for two weeks to rehearse new music — Anastasio wrote ten of the songs, with help from his lyric generator, Tom Marshall; bassist Mike Gordon wrote the other two — and then repaired to their studio in a barn outside Bur-lington, Vermont. The sessions were decidedly live, sometimes scruffy and not quite pristine audiowise (it’s possible to hear the piano pedals squeaking during the intro of the magnificent “Walls of the Cave”). But you can hear why they made these rehearsals the album: Virtually everything on these seventy-eight minutes breathes with an anxious, edge-of-the-seat intensity that’s missing from their previous studio efforts. Phish on record may never approach the energy of their live shows. But on Round Room, they’re doing more than jabbering and jamming — they’re sounding happy to be working together, and that allows them to reach truly new places. For that, you can forgive them a couple of Zen riddles.